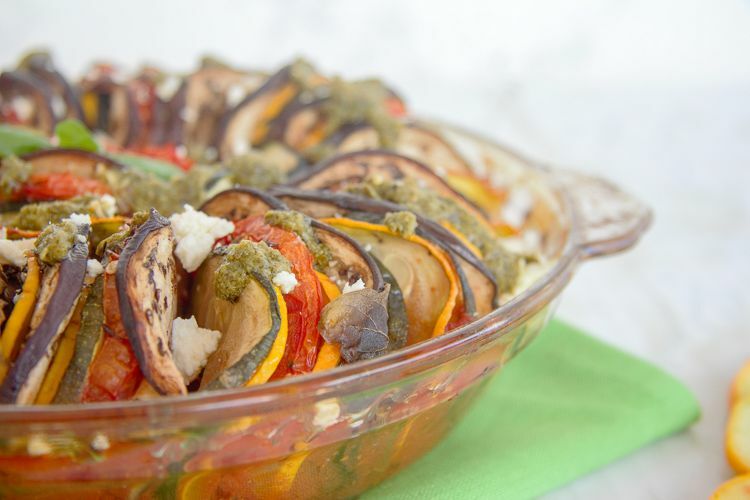 This baked ratatouille is an easy vegetarian dish that can be served either as a main or side dish. A simple colourful dish that takes minimum effort but looks great on the table! 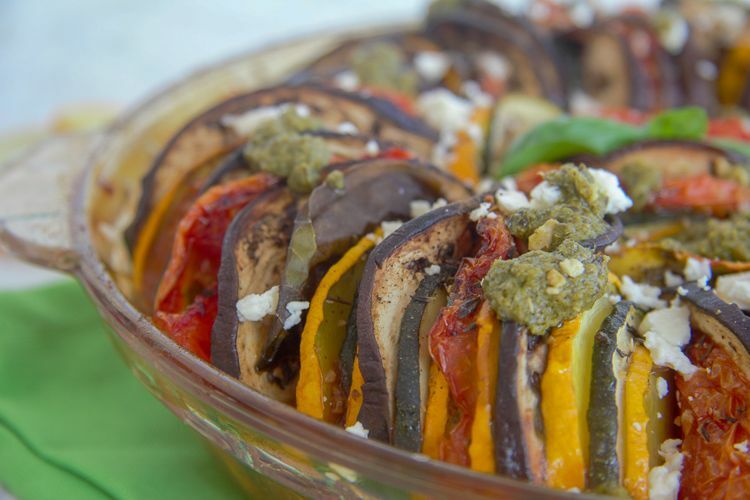 The beauty of a ratatouille is that is simple ingredients that are brought together to make a great dish. 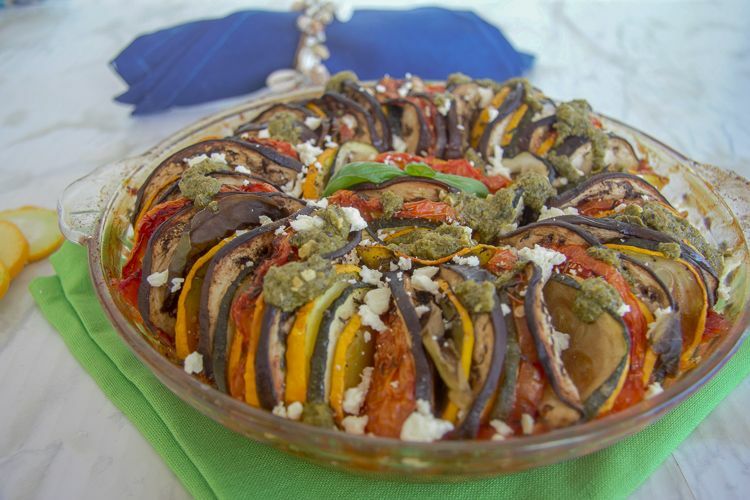 As I had eggplant, zucchini and tomatoes in my fridge that were all locally grown, along with my own grown basil, a baked ratatouille seemed the obvious choice to bake. 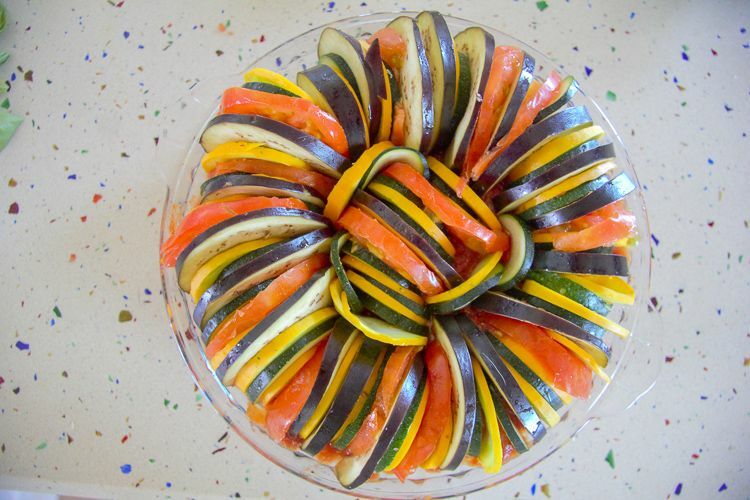 Intrigued by the Disney movie that featured a ratatouille served in a nouvelle cuisine style I thought that I would settle down for a relaxing afternoon of slicing vegetables with a Netflix movie in the background. Thanks to my rambunctious dogs this didn’t happen as they were in full bark due to a suspicious looking leaf in the garden. Then they all wanted to watch in the hope of a snack. 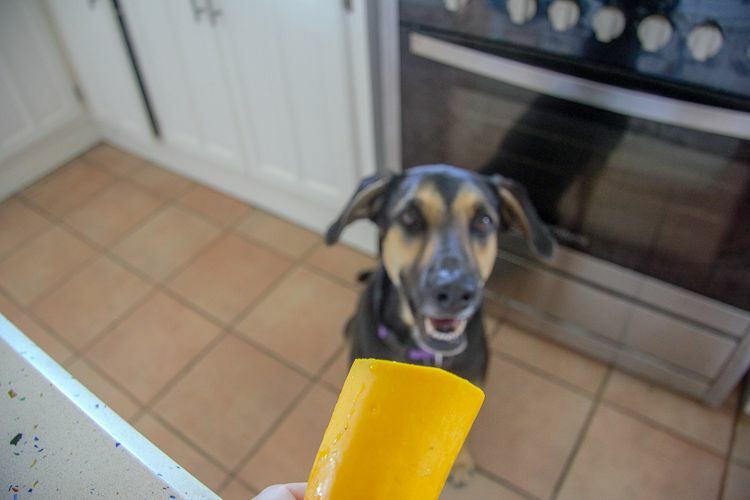 Sometimes I get no peace in my kitchen! I was trying to listen and watch “Pitch Perfect” as I sliced. The phrase “I’m gonna finish him like a cheesecake” makes me roar with laughter every time! 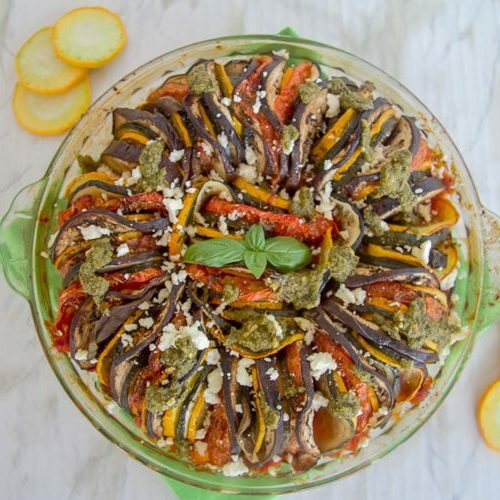 Ratatouille is a stewed vegetable dish originating from Provence, in France. It is a simple as sautéed vegetables simmered in a garlic infused tomato sauce with herbs. Although this sounds simple, it is packed full of flavour. 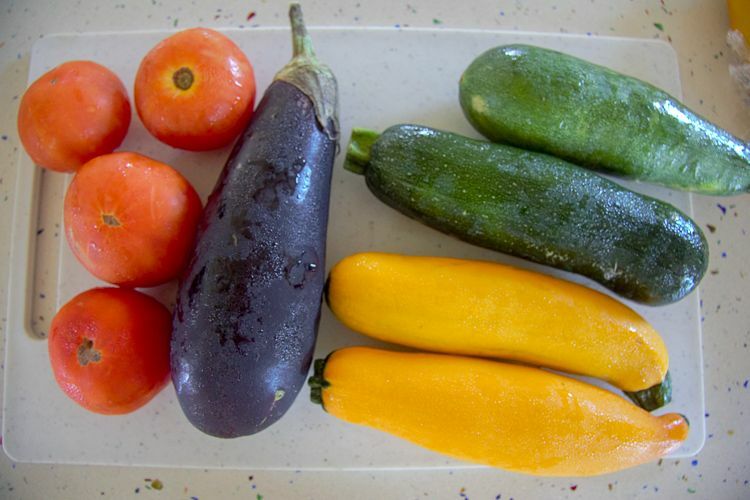 Vegetables traditionally used in ratatouille are tomatoes, zucchini, onions, eggplant and red peppers. 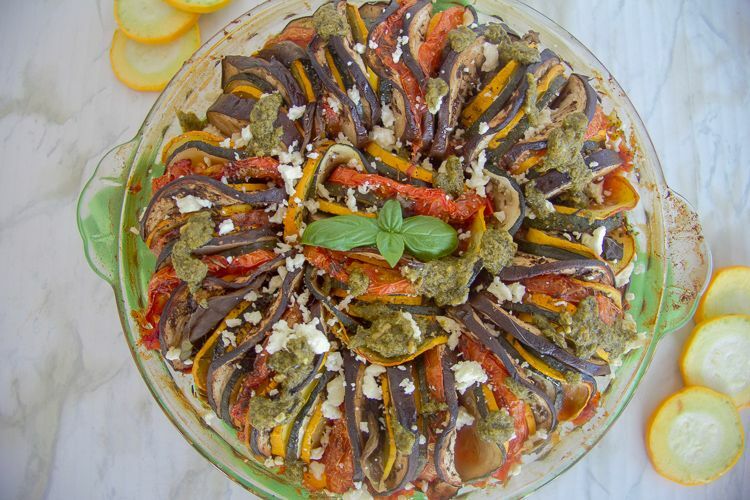 When looking at other baked ratatouille photos that were inspired by the film, I came across the question of was it based on a true story? I scoffed about the rat in the hat being the subject of the question, but the character of the chef was indeed inspired by a chef called Bernard Loiseau. He was an innovator of nouvelle cuisine and gained 3 Michelin stars. His tale was a sad one though as he suffered depression. 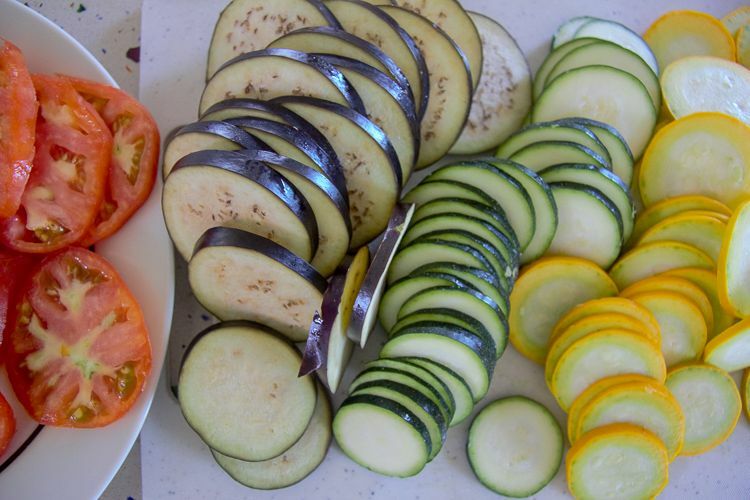 I kept the ingredients for my baked ratatouille simple with zucchini, eggplant and tomatoes but you could add your own flourish to it by using sliced onions or red peppers as well. I used a drizzle of pesto sauce with some crumbled Feta cheese when serving this. Parmesan or mozzarella would work well too. I ate this as a main vegetarian meal, but the Chief Taster enjoyed it as a side dish. 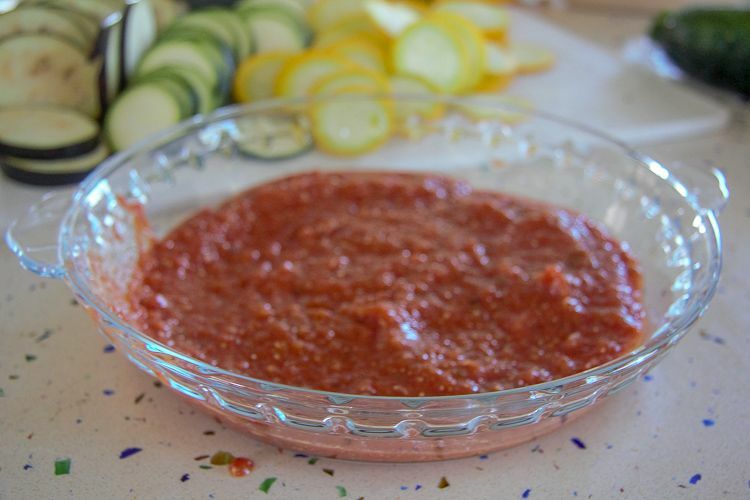 If you are entertaining, this would make a great side dish which could be easily prepared ahead too. As it was just us two devouring the baked ratatouille it lasted us a couple of days. I heated up the left overs with mozzarella slathered all over it. Delicious! An easy vegetarian dish with vegetable slices. Toss the sliced vegetables in the oil and seasoning. 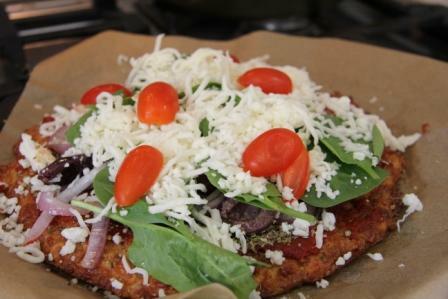 Arrange the slices on the tomato sauce in a circular pattern upright. 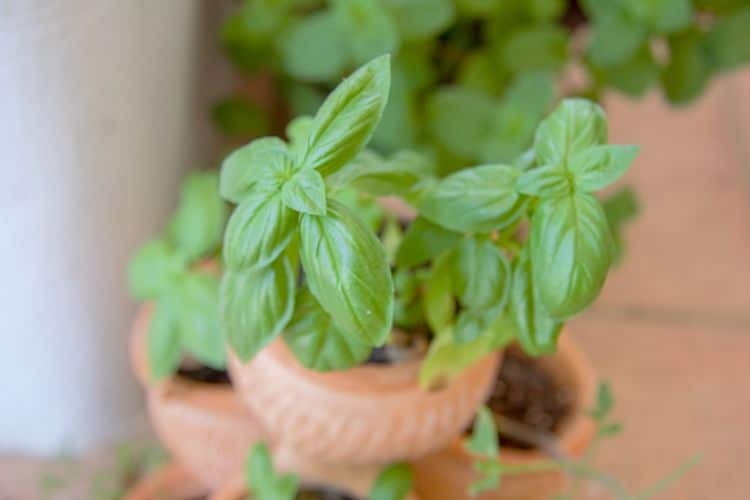 Place the fresh basil in between the slices. 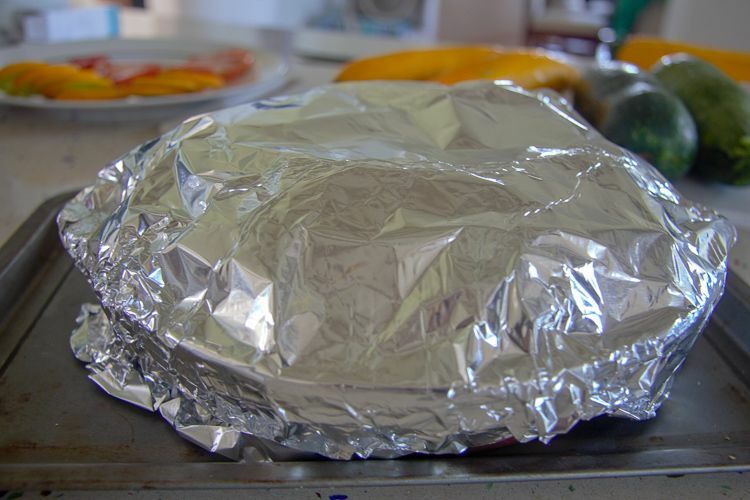 Cover the dish with foil and bake at 170C/375F degrees for 40 minutes. Remove foil and check that the vegetables are roasted and tender. Bake for a further 20 minutes uncovered.